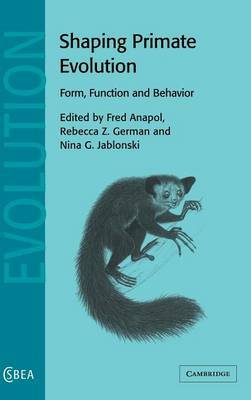 Shaping Primate Evolution is an edited collection of papers about how biological form is described in primate biology, and the consequences of form for function and behavior. The contributors are highly regarded internationally recognized scholars in the field of quantitative primate evolutionary morphology. Each chapter elaborates upon the analysis of the form-function-behavior triad in a unique and compelling way. This book is distinctive not only in the diversity of the topics discussed, but also in the range of levels of biological organization that are addressed from cellular morphometrics to the evolution of primate ecology. The book is dedicated to Charles E. Oxnard, whose influential pioneering work on innovative metric and analytic techniques has gone hand-in-hand with meticulous comparative functional analyses of primate anatomy. Through the marriage of theory with analytical applications, this volume will be an important reference work for all those interested in primate functional morphology.